BACKGROUND AND PURPOSE: We present early experience with the EKOS MicroLysUS infusion catheter for acute embolic stroke treatment in North America. This study was designed to demonstrate the safety of the device and to determine if sonography accelerates thrombolysis and improves clinical outcomes. METHODS: Fourteen patients aged 40–77 years with anterior- or posterior-circulation occlusion presented with cerebral ischemia 3–6 or 4–13 hours after symptom onset, respectively. Patients were treated with the catheter and simultaneous intraarterial thrombolysis. Procedural and clinical information, including time to lysis, degree of recanalization, National Institute of Health Stroke Scale (NIHSS) score, and modified Rankin Scale (mRS) score was recorded before treatment and afterward (immediately and at 24 hours, 1 week, 1 month, and 3 months). RESULTS: Ten patients presented with acute anterior-circulation emboli; four patients, with posterior-circulation emboli (NIHSS score, 9–23 [mean. 18.2] and 11–27 [mean, 18.75], respectively). Three deaths occurred at 24 hours: two from hemorrhage and one from cerebral swelling. Deaths also occurred at 1 week and 1 month after treatment. Thrombolysis in Myocardial Ischemia grade 2–3 flow was achieved in eight patients in the first hour. Average time to recanalization was 46 minutes. Mean NIHSS scores in eight of nine survivors at 90 days were 5 in the anterior-circulation group and 3 in the posterior-circulation group; mean mRS scores at 90 days were 2 and 3, respectively. No catheter-related adverse events occurred. CONCLUSION: Use of the EKOS MicroLysUS infusion catheter is feasible in the treatment of acute ischemic stroke. Further studies to evaluate its efficacy are warranted. More than 400,000 acute ischemic strokes occur in North America annually (1). The associated costs in individual disability and the strain on the healthcare system are staggering; these include an estimated $30 billion per year and dramatic loss of quality of life (2). In the Pro-urokinase in Acute Cerebral Thromboembolism (PROACT) study (3), roughly 3% of screened patients presented with isolated M1-M2 occlusions specified by the protocol and, therefore, advanced to treatment. A broader indication for therapy combined with the continuing improvement in the emergency response to stroke should translate into substantially more than 12,000 potential candidates for lytic therapy per year. Given the extreme sensitivity of the central nervous system to ischemia, once the decision to revascularize has been made to restore flow to ischemic brain, it should be done as quickly as possible. This should maximize salvage of the parenchyma and neurologic function. In addition, any decrease in total dose of thrombolytic should translate into fewer bleeding complications. The PROACT studies demonstrated a clear benefit with intraarterial thrombolysis in the setting of acute middle cerebral artery (MCA) embolic stroke when it is initiated within 6 hours of symptom onset (3, 4). Other series have shown that intraarterial thrombolysis can also effectively lyse thrombus in the distal carotid and vertebrobasilar arteries (5, 6). Prior in vitro work has demonstrated that high-frequency, low-intensity sonography can accelerate fibrinolysis. The stable cavitation believed to result from the sonography pulse wave generates local convection currents and microstreaming, which increases diffusion of thrombolytic agent into the clot and thus the effective surface area for the drug (7). The EKOS MicroLys US infusion catheter (EKOS Corporation, Bothell, WA) was designed to optimize these principles. The catheter serves as a microinfusion conduit through its distal port and creates a microenvironment of ultrasonic vibration to facilitate thrombolysis. These two properties should translate into better neurologic outcomes and decreased complication rates from bleeding due to thrombolytic therapy. This project was designed as a feasibility study. The primary goal was to demonstrate the safety of the EKOS catheter. The secondary goal was to assess the efficacy of the treatment protocol immediately after the procedure and then at 30 and 90 days after treatment. The study was performed under institutional review board approval at the participating institutions. The EKOS MicroLysUS infusion catheter is a 2.5F standard microinfusion catheter with a 2-mm, 2.1-MHz ring sonography transducer (average power, 0.21–0.45 W) at its distal tip. This transducer generates a 360° circumferential pulse wave around the distal tip. The catheter is designed to be used in conjunction with intraarterial thrombolytic infusion. The control system of the device consists of a PT-1+ power unit, a computer controller, and a catheter interface cable. The computer controller provides the user interface and data input and output. The power unit provides electrical power to the piezoelectric element and monitors the operating parameters, including element temperature, during operation of the device. The system ensures that the element temperature does not exceed the preset maximum temperature of 43°C. The catheter accepts a 0.010-inch guidewire and can be placed coaxially through a sheath-catheter system chosen by the operator (typically a 5F angiographic or 6F guide catheter). The study was conducted at four academic centers in the United States and Canada from January 2000 through July 2001. A total of 14 patients were enrolled in this initial feasibility study: five patients in Vancouver, four patients each in Portland and Buffalo, and one patient in Edmonton. A total of 515 patients were screened at Vancouver General Hospital. The total numbers of patients screened at the other institutions are not available. Patients between the ages of 18 and 77 years were eligible for inclusion. Other inclusion criteria included the following: absence of a confounding prior neurologic event, clinical signs referable to a treatable artery, an National Institute of Health Stroke Scale (NIHSS) score ≥8, no evidence of hemorrhage on CT scan, a time from symptom onset <6 hours for anterior-circulation occlusions and <24 hours for posterior-circulation occlusions, an ability to obtain informed consent from the patient or family members, and the patient’s exclusion from IV thrombolysis protocols. Patients were not excluded on the basis of the location of the occlusion. Patients with either anterior-circulation occlusions or posterior-circulation occlusions were included. At presentation to the emergency ward, and often en route to the angiography suite, patients were triaged by stroke neurologists (W.C., P.A.T., and A.I.Q.) and graded according to standard stroke scale scores including the following: NIHSS score, modified Rankin Scale (mRS) score, and Barthel index (BI) before treatment. Posttreatment evaluation by the stroke neurologists was repeated at 24 hours, 1 week, 1 month, and 3 months. As soon as possible, the patients were transported to the neuroangiography suite, and both sides of the groin were prepared in standard fashion. The patients were followed up with pulse oximetry and continuous cardiac monitoring. Arterial access was achieved, and a guiding catheter was placed into the proximal end of the affected vessel. The EKOS catheter was then advanced coaxially through this catheter over a 0.010-inch guidewire. The guidewire was passed through the thrombus, and the catheter tip was then placed into the proximal portion of the thrombus. Sonographic transmission was begun, and then a 2-mg bolus of tissue-type plasminogen activator (tPA) was administered through the catheter. In Portland, this was followed by a 0.3-mg/min infusion (maximum dose, 20 mg) for 60 minutes. In Canada, a maximum dose of 30 mg tPA was infused for as long as 120 minutes. In Buffalo, a maximum dose of 8 U of reteplase was infused for as long as 120 minutes. (Reteplase was used in Buffalo because of physician preference.) The sonographic transmission was continued for a maximum of 60 minutes at all institutions. Angiograms were obtained every 15 minutes, and the catheter was advanced into the receding clot as indicated. A 2000-IU bolus of IV heparin was administered immediately after the identification of an obstructing lesion. This was followed by the IV administration of 500 IU/h for 4 hours. After treatment, all catheters were removed, and hemostasis was achieved by using manual compression or a Perclose device (Abbott Laboratories, Redwood City, CA.). The Perclose device is a percutaneous suture arteriotomy closure device. The Perclose device was used in all four patients at Portland. Method of hemostasis was not recorded at the other institutions. Patients were admitted to the intensive care unit for overnight observation. The degree of thrombolysis in myocardial ischemia (TIMI) flow (8) in all affected segments, as determined by the operating physician (G.M.N., S.L.B., T.A.M., A.W., A.I.Q. ), was recorded at the start, every 15 minutes, and at the end of the treatment protocol. NIHSS, mRS, and BI scores were determined by stroke neurologists before therapy and at 24 hours, 1 week, 1 month, and 3 months. Adverse events included the following: hemorrhage, mechanical or sonography-related arterial injury, vessel rupture or perforation, vasospasm, vessel occlusion, distal embolization, allergic reaction to contrast agents, death, arrhythmias, and increased procedural time (which could have been attributable to difficulty in the deployment or operation of the EKOS catheter). These were recorded and reported to the U.S. Food and Drug Administration as required by the protocol. Thus far, 14 patients have been treated: 10 with anterior-circulation occlusions and four with posterior-circulation occlusions (Table 1). No adverse events were attributable to the catheter itself. Specifically, no perforations or dissections occurred from the low-energy sonography field generated by the catheter. Likewise, no perforations, dissections, vasospasm, or vessel occlusion resulted from catheter and wire manipulation independent of the sonographic transmission. No patient in the study had an allergic reaction to the intravascular contrast material, and no patient experienced a detectable cardiac arrhythmia. Five deaths occurred during the study. Three of the deaths occurred within 24 hours after treatment, and two others occurred within 1 week and 1 month. Two of the three early deaths (patients 7 and 14) resulted from intracranial hemorrhage. The third early death (patient 11) occurred as a result of cerebral edema. During treatment in this last patient, the vessels repeatedly became occluded after treatment, and TIMI flow was not restored. In one of the patients with an intracranial hemorrhage (patient 7), the EKOS catheter failed because of a cracked sonography element. Total clot lysis was demonstrated in this patient before a second sonography catheter was inserted. A cardiac embolus from a known chronic atrial fibrillation compounded the original carotid T occlusion. The patient who died within 1 week (patient 10) initially presented with a carotid T occlusion. Because of bradycardia and hypotension, the treatment was stopped early with the restoration of only TIMI 2 flow in the distal internal carotid artery and M1 segments and with persistent occlusion of the A1 segment. Notable cerebral edema developed and required neurosurgical intervention. The patient died 4 days after treatment as a result of nonhemorrhagic herniation. The patient who died 1 month after therapy (patient 4) initially presented with an MCA occlusion. After therapy, his condition improved. He was able to follow simple commands, but he remained plegic. Anticoagulation was restarted at 1 week for the treatment of chronic atrial fibrillation and atherosclerotic disease. After this, he developed an intracranial hemorrhage, became unresponsive, had respiratory difficulty, and eventually died. Nine of the original 14 patients survived for midrange follow-up. One patient (patient 3) was lost at 1-month follow-up but was present at the 3-month follow-up. The average pretreatment NIHSS score for all of these survivors was 18. This improved to an average NIHSS score of 7 at 1 month and 4 at 3 months. Likewise, the mRS score improved from a pretreatment average of 5 to a score of 4 at 1 month and a final score of 2 at 3 months. The BI scores also returned toward the prestroke average of essentially 20 before treatment. They progressively improved from an average of 8 at 1 month to 16 at 3 months. Contrary to expectations, the survivors with posterior-circulation occlusions actually fared better, on average, than those with anterior-circulation occlusions. The survivors with anterior occlusions presented with average pretreatment NIHSS and mRS scores of 18 and 5, respectively. These averages improved to 8 and 4 at 1 month, with further improvement to 5 and 2 at 3 months. The average 3-month BI in this patient subpopulation was 16. The two survivors with posterior-circulation occlusions presented with initial pretreatment NIHSS and mRS scores of 18 and 5, respectively. These improved to 5 and 4 at 1 month, with further improvement to 3 and 3 at 3 months. In this group, the average BI at 3 months improved to nearly normal at 19. Although the number of patients treated is small and does not permit statistically significant conclusion to be drawn, these results compare favorably with the mortality and symptomatic intracranial hemorrhage rates in the historical controls of the PROACT II study (4), the Emergency Management of Stroke study (5), and that of Brandt et al (6). Despite the inclusion of non-PROACT–eligible carotid-T and posterior-circulation occlusions in the EKOS study, the recanalization rates at 60 minutes were nearly identical each group (> 60%), with a higher percentage of TIMI 3 flow in the EKOS group (Fig). At 90 minutes, the discrepancy in TIMI 3 flow was even greater between the two groups. Likewise, the NIHSS, BI, and mRS scores, demonstrates lower pretreatment levels of function in the EKOS group, but the EKOS study demonstrated a higher percentage of >50% improvement in the NIHSS score after treatment. This can be explained by the higher average initial NIHSS score in the EKOS group. The mortality rate and symptomatic intracranial hemorrhage rates are also higher in the EKOS group (Table 2), but this finding is consistent with the greater severity of ischemia at presentation and the substantially greater delay in presentation with the EKOS group. An advantage of the EKOS results over the historical controls is that the regularly intervaled angiograms allowed demonstration of early recanalization in the patients in the EKOS study. This study was designed primarily as a feasibility study to establish the safety of the EKOS MicroLysUS infusion catheter. The absence of detectable adverse events attributable to either the intraarterial sonographic transmission or the catheter and wire manipulation suggests that the catheter is a safe medical device. A perceived limitation in the tested device is the need to use an 0.010-inch guidewire, which can potentially limit access when high degrees of vessel tortuosity are present. The manufacturer is currently developing a version of the EKOS catheter that is compatible with a 0.014-inch guidewire. The benefit of local intraarterial thrombolysis in the treatment of acute embolic stroke in the MCA territory, if given before 6 hours after ictus, was clearly demonstrated in the PROACT studies (3, 4). Other series have also demonstrated successful recanalization of the vertebrobasilar and distal ICA territories with local thrombolysis (5, 6). Once the decision to perform thrombolysis is made, time is of the essence to maximize salvage of the brain parenchyma and also to minimize the doses of thrombolytic administered to prevent complications of lysis. Despite the potential benefits of localized intraarterial thrombolysis, some fundamental obstacles remain. Older thrombi lose their intrinsically bound plasminogen (the substrate for thrombolysis) and retract while undergoing chemical changes that make them less receptive to thrombolysis (7). Emboli cause approximately 32% of all ischemic strokes (9), and those in a substantial portion of patients with acute cerebrovascular accidents who present for treatment would be relatively resistant to thrombolysis as stand-alone therapy. In addition, the stumplike occlusion (7) typical of intracranial occlusions and the standard end-hole infusion microcatheter provides a minimal surface area on which the thrombolytic agent can act. Treatment with the EKOS MicroLysUS catheter may accelerate recanalization of occluded vessels. An in vitro increase in thrombolysis has been shown to be nonthermal and nonmechanical in nature, with an optimal frequency of transmission of approximately 2.2 MHz (7). Also, sonographic transmission has been shown to establish a stable cavitation, which allows microstreaming to increase the effective surface area of the clot exposed to the thrombolytic. Any effect of the EKOS catheter, therefore, presumably results because this cavitation and microstreaming tends to increase the surface area of clot that is exposed to the thrombolytic agent and the circulating plasminogen. Although not statistically significant, the results of this preliminary study are encouraging. Despite the inclusion of patients with distal ICA occlusions (ie, the carotid T group) and those with vertebrobasilar occlusions and despite a longer average time to treatment (5.52 vs 4.70 hours), the rates of recanalization are similar to those of the PROACT studies. Likewise, the overall clinical outcomes, as measured with the 90-day mRS scores of ≤ 2, are similar to the historical controls. Because these subgroups of patients typically have a larger volume of thrombus, lower recanalization rates and poorer clinical outcomes are typically expected. The near parity of the functional neurologic status between these patients and those with purely MCA occlusions treated in the PROACT series suggests that the EKOS catheter may in fact accelerate thrombolysis and thereby lead to a better neurologic recovery. The numbers in this study are small and cannot show statistical significance. However, the trends demonstrated that the rates of recanalization and neurologic outcomes in patients treated with the EKOS catheter were equivalent or slightly better than those in patients treated with standard microinfusion. A large-scale clinical trial seems justified at this time. The EKOS MicroLysUS catheter appears to be a safe medical device. Simultaneous intraarterial sonography and thrombolytic therapy may also be effective alternate therapies for the treatment of acute embolic stroke in both the anterior and the posterior cerebral circulations. Possible areas of further investigation include a large-scale efficacy trial involving the infusion of plasminogen and thrombolytic through the catheter and the development of larger transducer surfaces to allow peripheral applications. A large-scale efficacy trial has just begun at the writing of this paper. Sponsored by EKOS Corporation and supporteded in part by NIH-NHBLI grant no. 1R44HL64434–01. Presented in part at the 39th annual meeting of the American Society of Neuroradiology, Boston, MA, 2001. Accepted after revision September 23, 2002. 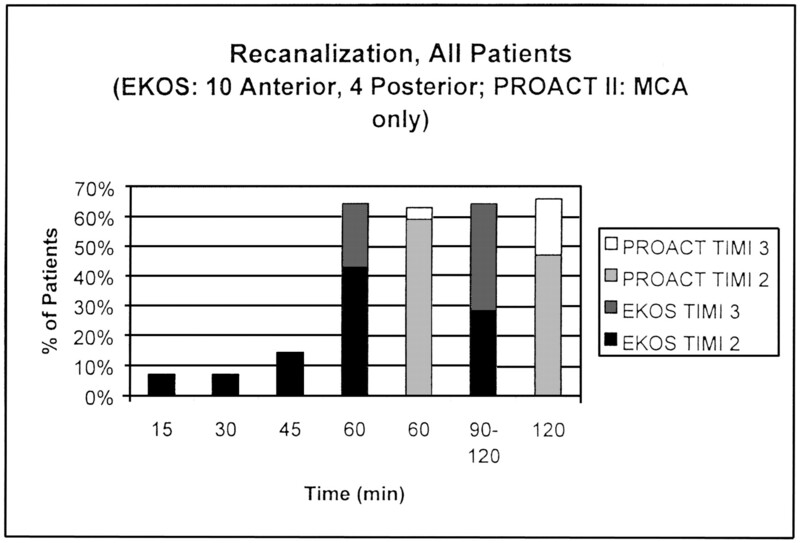 Recanalization rates in the EKOS study (all patients) versus the PROACT II study. MR and CT Monitoring of Recanalization, Reperfusion, and Penumbra Salvage: Everything That Recanalizes Does Not Necessarily Reperfuse! Imaging-guided acute ischemic stroke therapy: From &quot;time is brain&quot; to &quot;physiology is brain&quot;.